It is easy to see from a quick reading that the book of Proverbs teaches its readers how to be holy, happy, and healthy. But many of us do not receive the full benefit of the book’s teachings, for many of its proverbs are “dark saying,” difficult to exegete and hard to understand. Consequently, we need the help of men gifted with understanding if we are to properly appreciate the book and the fully appropriate its teachings. Rev. 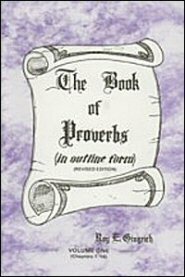 Roy Gingrich has done us a genuine service in writing this outline commentary on the book of Proverbs. He has diligently studied the book of Proverbs, he has carefully studied the best commentaries on the book of Proverbs, he has earnestly prayed for an understanding of the book of Proverbs, and as a result of all this labor, he has given to us this helpful commentary on the book of Proverbs.